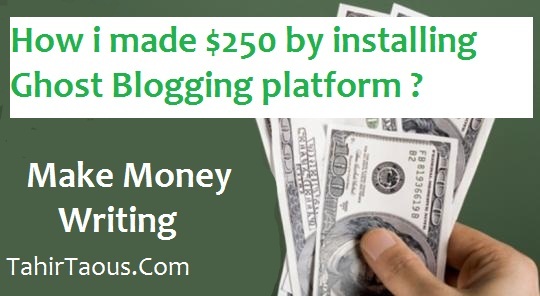 How i made $250 by installing Ghost blogging platform ? When did you started using computer and when did you install your first software on your PC ? How many times have you made money after installing a software ? how much money have you made ? I have been using computer for many years and i installed first software many years ago, i have installed software hundreds of times but i was never paid a single dollar, but in November 2013 i installed a software and i made $250. I am not joking, it is true and it was very interesting experience. I love to learn and share about Web design. HTML, CSS, Front end development frameworks (twitter Bootstrap, foundation etc) and WordPress or any topic about Web design. WordPress is my favorite Content management System to create blogs/websites. I love to read, learn and share about WordPress. In 2013, a WordPress developer John O’Nolan wrote a blog post and shared his idea to create a new CMS, that will focus on one thing : BLOGGING. John wrote that WordPress is much more than just a blogging platform and there should be a simple solution for Blogging. His blog post went viral and people loved and supported his idea. John started a KickStarter Campaign for Ghost and people supported it generously. Ghost collected £196,362, while his goal was £25,000 only. Ghost claimed to replace WordPress as a blogging platform, as a WordPress lover and user i was very curious and excited i wanted to know if Ghost will be able to deliver what it is claiming. In October 2013 Ghost team announced the first public release of the Ghost blogging platform to the public, i downloaded Ghost because i wanted to know what is exciting about Ghost blogging platform. Ghost was not PHP based content Management System like other popular Content management System such as WordPress, Drupal, Joomla and others, Ghost was Node.js based blogging platform. PHP is widely supported and everyone can buy a cheap/affordable web hosting plan and PHP will be supported. But Node.js is not supported as widely as PHP, You will have to pay extra money, if you want Node.js based server. It was expensive and not every one was ready to spent extra money. First impression is the last impression and to be honest first impression of Ghost was not very good, Ghost claimed to make Blogging simple but it made first process complicated. Installation is the first process to use any software and to run Ghost you need a Node.js supported server and for local installation you also need to install Node.js. I was able to install Ghost on my local PC successfully because i used to know that how to use command line, it was not a big problem, after using Ghost i wrote review of Ghost blogging platform and submitted on a blog, that accepts Guest posts. After some changes my guest post was accepted and i was paid $50 for that blog posts. Ghost review was my first blog post for any blog, that pays their writers, that was first time when i made some money online. In comments many people criticized ghost and said Ghost failed to deliver promising features. Many people said that Ghost should be PHP based blogging platform because PHP is widely supported. Installation of Ghost was difficult and complicated on live web server and local PC. When i read comments, i decided to write another blog post How to install Ghost., it was easy for me to explain everything in details, I wrote a tutorial and submitted on sitepoint.com. Ricky Onsman was editor of sitepoint.com at that time, now he works as a freelance developer. There were many grammar, mistakes in my tutorial, Ricky helped me to write better tutorials and explained the process how to write articles and tutorials for sitepoint.com. Ghost installation tutorial was my first tutorial for Sitepoint, after making some changes my tutorial was published on sitepoint.com. I was paid $200 dollar for Ghost tutorial. It all started with installation and then sharing my knowledge, You can also share your knowledge as well. Just start sharing your knowledge and start writing for popular blogs to increase blog traffic, email subscriber and make money as well. Have you ever written for any blog, how was the experience ? have you any problem or questions lets discuss in comments. Hey bro thanks for sharing this information, I’m about to start a blog with ghost, I’ll tell u later what happens haha.